In the late-spring and early summer, homeowners often notice large, black bees hovering around the outside of their homes. These are probably carpenter bees searching for mates and favorable sites to construct their nests. 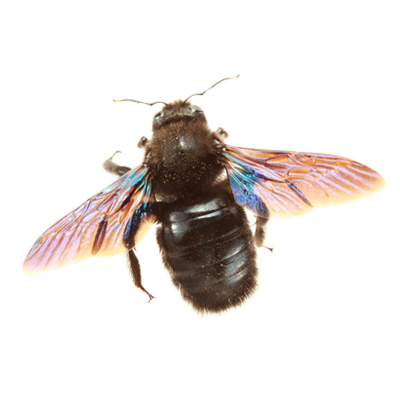 Male carpenter bees are quite aggressive, often hovering in front of people who are around the nests. Although carpenter bees are less aggressive than wasps, female bees provisioning their nests will sting.Carpenter bees drill a perfectly round 1/2 inch diameter hole into the wood. They frequently drill into bare unfinished wood including eaves, window trim, fascia boards and decks. After drilling a hole against the grain, the bee turns at a right angle and tunnels along the grain of the wood. Over time, these bees will cause considerable damage.For prompt control of these damaging pests call our experts at 1-800-525-4825.